Sometimes life hands you a mystery. A real, printed book. Bound and everything. 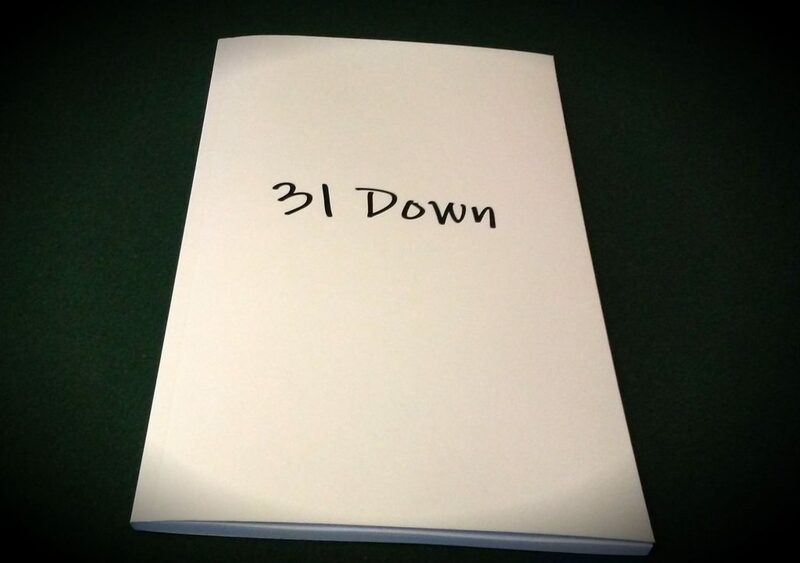 31 Down is a collection of 32 song lyrics written by the time I turned 31 years old. Most of the lyrics appeared on this site from 2014 to 2017. Drawing on my love of country and folk songwriting, the lyrics are built on story, character, and life-affirming insight, which make them a more interesting read than might be imagined. They’re like little vernacular poems, with repeating choruses. Taken together, they’re a good encapsulation of what I’ve thought about, struggled with, laughed at, and (convinced myself that I’ve) learned in life thus far. If I can be said to have any sort of a philosophy, much of it is tucked in these pages. The book is slim, 70 pages or so, perfect bound, 8.5 inches by 5.5 inches. I have a small number on hand, a few of which have already been spoken for. If you’d like one of the others, I can offer them for $8 postpaid to anywhere in the continental United States. Simply PayPal me. If you’d like one of the others, you can order here.